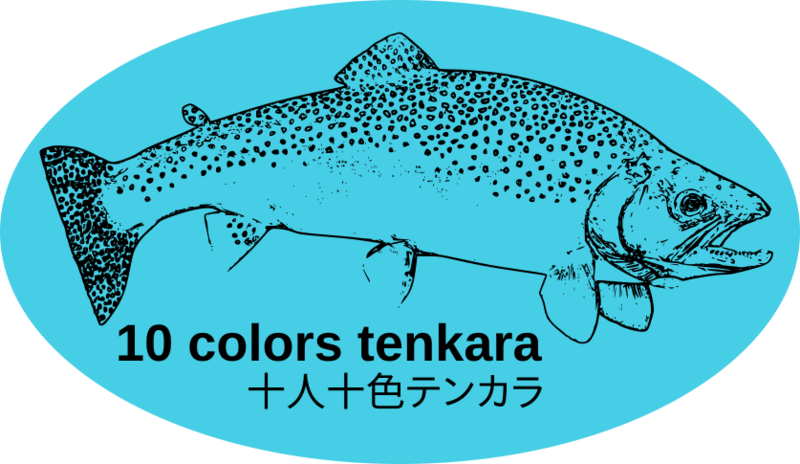 This was a toss up being placed in the trip forum or the tenkara. I fish a trout managment area that dumps in a variety of trout. Typically a good mix of rainbows, browns, brooks, and some token tigers. This year I have done 6 outings at this location, and all of them have produced rainbows…and only rainbows. Yesterday, I landed 7, dropped a couple confirmed rainbows, and had several unconverted takes…that looked like rainbows. I do not think I have seen so many rainbows across a long stretch of river. I suspect the State is planting them for their toughness…but I know there are browns in there and I have visual confirmation on some nice brookies. Why am I only catching the stupid trout? aka rainbows? The weird thing is that I had some takes in the pool with the brook trout and after two outings I finally landed a fish and it turned out to be a rainbow. I cannot get away from them. I tried all kinds of different presentations. And Yes, there where a half dozen identified brookies milling around the pool. The other interesting thing. Even the rainbows were exhibiting really spooky behavior. I was 20 feet from the edge of a pool creeping up and I still spooked a large trout, which I assumed was a rainbow. I continued my crawl to the casting position from behind a tree…and looked where I saw the fish flash and there was nothing. Ususally rainbows will return to their lie…not this one. Nor did I catch a thing in that pool. In another pool. I had a large rainbow come up and grab my grave digger. Missed the hookset as I marveled at his size. He did not return. It seemed like all these missed trout were one an done. A trait I thought only limited to browns. Help a brother out…what is going on? The uptown trains are on the downtown platform and the downtown trains are on the uptown platform. oh spring…speak to me in the language of bugs!!! The rainbows are more opportunistic feeders is my guess. So even if they aren’t hungry they are going to eat regardless and thus, getting the drop on the others. I would agree with @R_Ruff about rainbows being opportunistic feeders. Personally, I have certainly experienced the “one and done” behavior with brook trout; especially during their Autumn spawning. But, have also experienced that during low insect activity with them too. It’s not something I’ve experienced with browns, though. Brookies are hesitant to get started feeding in the spring too. I’m surprised the browns weren’t going after the stoneflies, they usually hammer them around here. Last summer, I was fishing in central Vermont and the rainbows would hit hard once then move location. I observed it happening, but I also caught one rainbow that had a scar near it’s tail on its left flank and then caught it again about 20 yards away (that was a first for me). There were tons of mayflies that day and lots of stonefly shucks lying around. Like you, I never figured it out. I can’t wait for spring and I’ve got 7 weeks to go. Thanks. The info is helpful. The one and done note was with the rainbows, which is a new behavior for me to experience. Ususally I find them to be relentless, or convertible by switching flies. Perhaps what I witnessed was your note on them packing bags and being highly mobile. It wasn’t that they didn’t take another offering. Its more likely that they moved spots, which is something I didn’t know was a potential behavior for them. Is there a comprehensive book somewhere on trout behavior in a stream? Not fly fishing specific, but more of an overview of what makes them tick. I had been told by an angler that rainbows are highly sensitive to attributes of the water. Temps…ph…oxygen levels. If they don’t find it favorable they split. It makes sense, but I have no idea if it is true or just a general note that seems to makes sense. Perhaps they split in search of forage like a pack of wolves. Are all species stocked, or only the rainbows? All are stocked. I checked and I was wrong…2017 they did not plant any tigers. There were a ton of browns in the spring and caught some then. I do not fish it in the summer or early fall. The last stocking was in October…111 days ago. Perhaps they only dumped the rainbows in the fall. So the rainbow to other ratio should be around 50/50…but my catch rate is not. I have been trying to target the typical brown lies but I come up empty. I have caught the same rainbow twice before in the same riffle, on the same fly. It was a stocked one with a little lip damage. I released it and continued working the same area and wouldn’t you know it, caught the same one a few casts later! I released it and moved on at that point. Guess he was hungry.